The beginning of this entertaining and relaxing activity is at 8:45am. 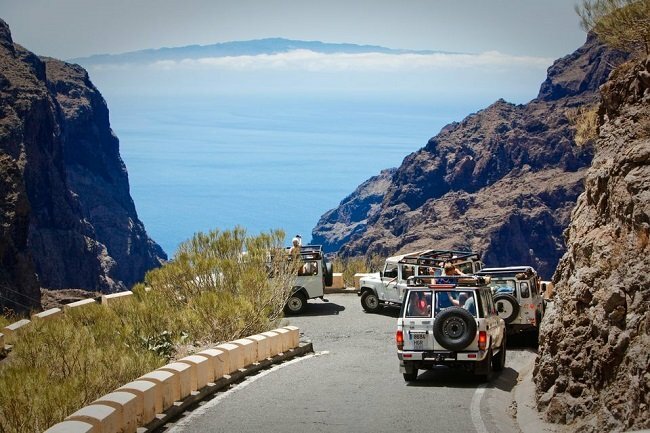 The jeep safari of Mount Teide and Masca takes place throughout the entire year from Monday to Saturday. We are comparing Teide-Masca 7-Hour Jeep Safari with Pick-up Prices from leading ticket suppliers and Try to find you Cheap tickets prices on the market. The "Teide-Masca 7-hour Jeep Safari" is an entertaining tour that takes you to some of the most beautiful places on Tenerife Island. Mount Teide is a national park and the highest mountain in Spain. Masca is a region rich in flora, fauna and beautiful landscapes, and the site of the highest village in the country. The Teide-Masca jeep safari also tours some of the hidden gems of this beautiful island you should discover. Finally, you will perceive how violent volcanic eruptions in the past made this region so beautiful and diverse. For your convenience, you will begin and finish the jeep safari with transfers from and to resorts in South Tenerife. This type of activity is ideal for the adventurers and people who like to spend time in the nature. True gourmands should also consider joining the tour because you will visit the restaurant serving typical Canary dishes. Finally, everyone who likes to take photos of beautiful landscapes will enjoy the jeep safari. Your Experience With Teide-Masca 7-Hour Jeep Safari with Pick-up? Touring of Mount Teide and Masca allows you to appreciate the immense beauty of these regions. As you get around, you will learn how volcanic eruptions shaped the landscape and allowed the growth of beautiful flora. In this jeep safari tour, you will discover the best Mount Teide and the Masca region have to offer in an efficient manner. Also, the route takes you to Vilaflor, the highest village in entire Spain. What Teide-Masca 7-Hour Jeep Safari with Pick-up Includes? The Teide-Masca safari tour includes transportation by the jeep. Fuel and insurance expenses are included in the price of the jeep safari. Experienced, knowledgeable and certified guide leads the safari. Pickups and drop-offs are included from resorts in South Tenerife. Make sure that you aren't height-sensitive and that you can endure lower oxygen levels before joining the tour. Take warm clothes because temperatures on Mount Teide are lower than in the resorts. Travelers Reviews about Teide-Masca 7-Hour Jeep Safari with Pick-up? This tour's rating on Get Your Guide is 4.7/5, and 5/5 on Viator. People that took part in the jeep safari are mostly satisfied with the overall experience. They also commend the performance of the guides. "Fun," "amazing" and "beautiful" are some of the epithets used by travelers to describe the experience. The Jeep Safari of Mount Teide and Masca isn't suitable for disabled people. Prepare either mobile or paper voucher to enclose to join the Mount Teide-Masca Jeep Safari. Both providers allow the option of the refund for timely cancellations. If your accommodation isn't among places scheduled for transfers, you will receive the nearest meeting point for the beginning of the jeep safari. Bring sunglasses, sunscreens and warm cloth for this activity regardless of the season. It is essential for you to have comfortable footwear on this trip. The beginning of the tour takes place at your hotel or at a meeting point that is within the close proximity from there.